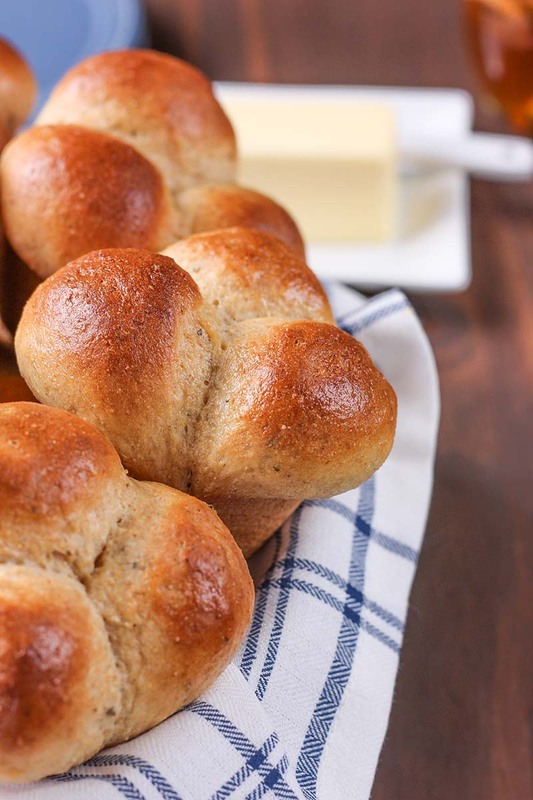 These Herbed Wheat Cloverleaf Rolls are perfectly light and fluffy while only taking 45 minutes to make from start to finish! A light, savory herb flavor gives these dinner rolls a unique flavor perfect for pairing with soups, chicken, and, of course, Thanksgiving dinner! In the bowl of stand mixer affixed with a paddle attachment, combine white whole wheat flour, yeast, salt, dried thyme, dried oregano, dried basil, and garlic powder. In a small bowl, whisk together milk, water, honey, and egg. Add wet ingredients to dry ingredients and beat until just combined. Add bread flour and melted butter. Switch to a dough hook and knead until dough is smooth and elastic. Dough should pull away from sides of bowl and be slightly sticky. If dough is too sticky, add up to an additional ¼ cup bread flour, 1 tablespoon at a time. Butter or spray with non-stick cooking spray the bottom and sides of 12 cup muffin tin. Set aside. Turn dough out onto floured surface. Divide into 12 equal pieces. Divide each piece into 3 equal pieces. Take each piece of dough and roll into a ball. Place 3 balls of dough in each cup of the muffin tin. Cover and allow to rest for 15 minutes in a warm location. While dough is resting, preheat oven to 400°F. Bake for 10-12 minutes, or until tops are golden. Remove from oven and brush with butter. Can these rolls be made ahead and frozen? If so, how to prepare after freezing? We don’t recommend freezing the dough before baking. I would suggest to par-bake the rolls, then freeze them. Here’s a link with prepare ahead tips: https://redstaryeast.com/yeast-baking-lessons/postpone-baking/.